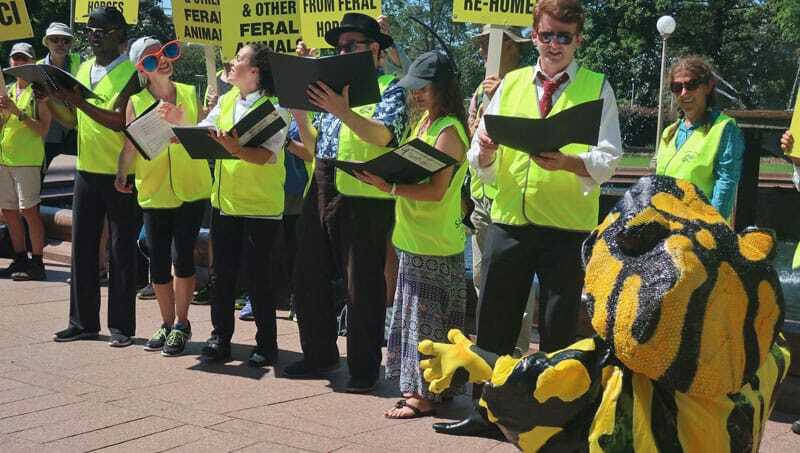 Sydney to Kosci walkers tell feral horse advocates: Take a hike! Save Kosci walkers kick off their hike to Mt Kosciuszko with a sing-along with the Cantabile Chior in Sydney. More than 100 ‘Save Kosci’ protest walkers began a 560km trek from Sydney to the summit of Mount Kosciuszko in November in a bid to overturn the NSW government decision to protect destructive feral horses in Kosciuszko National Park. They are also calling on the NSW government to implement the 2016 Draft Wild Horse Management Plan as a first step in managing feral horse numbers. The plan aims to reduce horse numbers in Kosciuszko National Park from 6000 to 600 over 20 years. Their trek can be followed on the Save Kosci Facebook page. “It’s heartening that people who care about the natural heritage of our national parks are willing to say enough is enough. It’s a park, not a paddock!” said Richard Swain, who heads up the new Reclaim Kosci campaign, which is led by the Invasive Species Council and supported by major NSW and ACT environment groups. “This is a positive step that shows the current state government the community does not want our national parks trashed by feral horses. “The protection of feral horses in Kosciuszko is an act of blatant disregard for the overwhelming scientific evidence that shows horses are destroying our unique and fragile ecosystems. The walk has been organised by a group of bushwalkers called Save Kosci. More than 250 people have registered for the 560km trek, with walkers expected to arrive at the summit of Mount Kosciuszko in mid-December. People can still register for all or part of the walk.